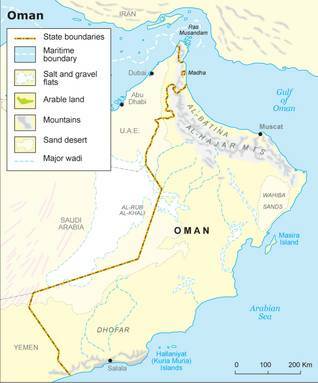 Oman borders the Arabian Sea, the Gulf of Oman, and the Persian Gulf, and has land boundaries with Saudi Arabia, Yemen, and the United Arab Emirates (UAE). Its area totals 309,500 square kilometres, of which 82 percent is desert, and 15 percent mountainous. Its size is comparable to that of France or Spain. The land boundaries total 1,374 kilometres: 676 kilometres with Saudi Arabia, 410 kilometres with the UAE, and 288 kilometres with Yemen. The coastline measures 2,092 kilometres. The climate is dry and hot in the interior desert, hot and humid in summer in the coastal area, and moderate in winter. There is a strong south-west summer monsoon or kharif (May to September) in the southern area around Dhofar. Oman’s maritime claims are: territorial sea twelve nautical miles, contiguous zone 24 nautical miles, and an exclusive economic zone of 200 nautical miles. An elongated mountain range, al-Hajar, runs from the north-west to the east, parallel to the Gulf Coast. It is divided in a western range, al-Hajar al-Gharbi, and an eastern range, al-Hajar al-Sharqi. Behind the western range lies a fertile coastal plain, al-Batina, with many ports and fishing villages. This has become one of the most industrialized, urbanized and highly populated areas in the country. The eastern range extends to the sea at the easternmost cape of the Arabian Peninsula, leaving only a small strip of land for habitation. Scattered along the indented beaches and natural bays are many fishing ports and villages. In the valleys and on high plateaus in the mountains, villages and settlements are located in places where water is available. More oases can be found between the mountain foothills and on the fringes of the desert. Riverbeds (wadis), which are dry for most of the year, intersect the plains. 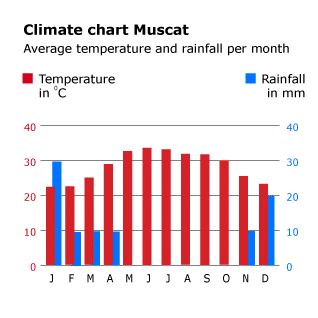 Oman has a desert climate with an average annual rainfall of 100 millimetres, declining to 50 millimetres in the interior. In the mountains rainfall can rise to 350 millimetres. Summer winds in sandy desert areas can cause heavy sand and dust storms. There are periodic droughts and periods of heavy rainfall, which can cause temporary floods. Nomads in these areas breed livestock for a living. The southern region of Dhofar is favoured by monsoon winds that bring a considerable amount of rain during the summer. The seasonally verdant mountains and plains allow for more intensive livestock breeding and agriculture. The regional capital, Salalah, lies on the coastal plain. Oman has a number of islands located in the Gulf of Oman and the Arabian Sea, the biggest of which is Masira. 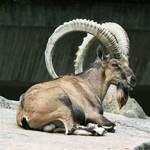 Oman has a rich diversity of flora and fauna, typical of a desert environment. 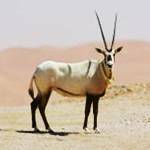 The Arabian oryx, gazelle, antelope, Nubian ibex, Arabian tahr, wild rabbit, bustard, striped hyena, black hedgehog and leopard are examples of rare wild animals. 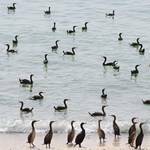 Migratory birds visit the coastal areas and islands. The reefs provide a habitat for a vast array of marine wildlife. On the reefs some 108 types of coral can be found. However, Oman’s biodiversity is under threat as a result of the exploitation of the oil fields, industrialization and, to a lesser extent, tourism. Oman has limited water resources. The country is dependent on groundwater and its limited rainfall (of around 100 millimetres annually) for about 65 percent of its water supply. The remaining 35 percent comes from desalinated seawater. While grazing lands, land for agriculture, and wildlife have always provided the mainstay for food production, the marine environment and fishing were the most important resources in the coastal parts of the country. Today, however, oil and gas, which have been exploited since the 1960s, are the most important resources of national income. Among the member states of the Gulf Cooperation Council Oman has one of the smallest proven oil reserves: 5,500 million barrels. More important are its gas reserves: 30,000 billion cubic feet (EIA, 2013). Other resources include copper, chromite, magnesium, gold, coal, industrial ores and raw materials for building materials such as sand, silica, marble, and limestone. 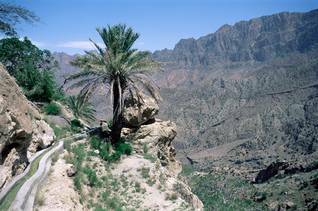 The cultivable area of Oman is 2.2 million hectare, less than 7 percent of the total area. Only 61,550 hectares are irrigated and cultivated land. In the desert area, extensive farming has been developed in connection with oil exploration. Agriculture is enhanced in inner Oman. Date palm gardens are traditionally irrigated by the falaj system in the oases. Water for irrigation is channelled through the falaj (plural: aflaj). This is an ancient network of man-made channels, partially underground, that links wells in the mountains or river beds with the oases and their gardens. Through an ingenuous use of siphons, water can be guided beneath dry river beds. The system dates back some two millennia and is probably of Persian origin. Five aflaj out of the 3,000 still in use, are on UNESCO‘s World Heritage List. Around or outside the oases, larger farms (though most are less than ten hectares) are irrigated by pumped water. Crops include dates, mango, bananas, pomegranates, limes and other citrus fruits, and in the southern region also coconuts. The farms also produce a wide range of vegetables: carrots, aubergines, onions, and tomatoes, as well as tobacco, and alfalfa for feed. Most of these products are destined for the local and regional markets. 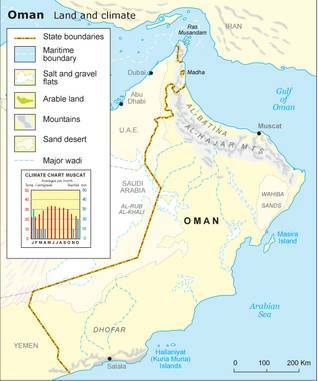 The Sultanate’s reserves offer examples of Oman’s rich and unique biodiversity. Each seeks to protect its particular wildlife, for example the green turtles at Ras al-Hadd Turtle Reserve, the oryx at the Arabian Oryx Sanctuary, the Arabian tahr of Wadi al-Sareen and the Arabian leopard of the Jabal Samhan Nature Reserve. The Damaniyat Islands are protected to safeguard nesting birds, hawksbill turtles and the rich marine life on the coral reef. Turtles are protected and active tagging and tracking programmes have been launched to study their migratory habits. Seven tidal inlets (khawrs) in Dhofar are listed as protected wetlands. 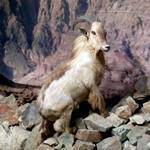 One of these, al-Saleel, is a national park. The Botanic Garden in al-Khawd in the capital area conserves and exhibits the native flora of Oman. 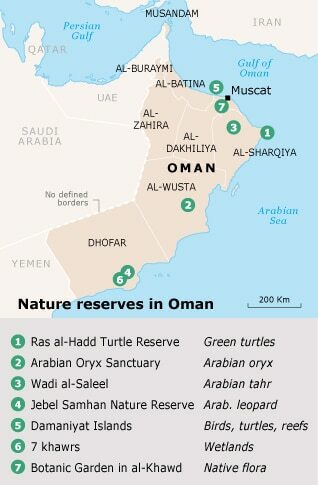 The total protected area covers 9.6 percent of Oman.